I don't make resolutions. I've seen too many of them come crashing down in tattered, abject failure to bother even pretending that I'm going to take a big leap into self-improvement just because of some arbitrary date on a calendar. But as 2008 grinds to its inevitable close, I do find myself looking forward to the year ahead and a few things I should do not because I need to, but because I want to. 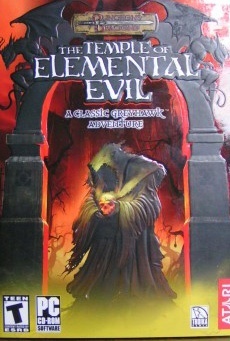 For instance, I want to replay the Temple of Elemental Evil. This has been driving me nuts all year. 2008 was the ten-year anniversary of Baldur's Gate, the first title in my favorite RPG series of all time, but for whatever reason it's the Temple of Elemental Evil that I can't stop thinking about. Prior to its release in 2003 the game represented, in my eyes at least, the next chapter in the ongoing resurgence of the D&D-based computer RPG, but the end result - a flat, buggy, incomplete mess - failed to impress and was almost immediately forgotten. But five years later, unofficial mods and updates have added a whole new level of polish and completeness to the game, and as Baldur's Gate recedes into memory I find myself wondering if perhaps my fondness for that game didn't unfairly taint my expectations for Temple. Was it really as bad as I remember? It's not like I don't have other things to do with my time, but I suspect that if I don't at least try to play this thing again in 2009, my brain will explode. Speaking of Baldur's Gate, this will finally be the year in which I try Dradeel's famous recipes. Except they're not really famous, so allow me to explain. As you make your way through Baldur's Gate 2: Shadows of Amn, you'll eventually find yourself in Spellhold, an asylum of sorts for wayward magic users. Among the inmates contained therein is an elven mage named Dradeel, quite insane but also apparently something of a chef; as part of your encounter with him you'll be randomly given one of a number of recipes that looks suspiciously real. Naturally, I decided to turn these in-game recipes into real-world food after I finished the game, but here we are eight years later and I still haven't actually gotten around to it. But no more putting it off! This year, for real and for sure, I will sample Baldur's Delight, Monkey Balls and whatever others I can dredge up, and I dearly hope that after a decade of procrastination and forgetfulness I won't be disappointed.